Everyone agrees that the common Odesa I trident overprints were produced by typography (Buchdruck) using a plate of 100. In his 1953 publication - the cover is shown above - Dr Seichter says (in effect) that there was a master horizontal cliché of 5 positions (a - b - c - d - e) which he illustrates (see also above). From this master, all the cliches were made and minor variations can be found giving rise to Plate varieties occurring only once in the sheet: John Bulat illustrates 5 notable varieties at page 79 of his Handbook though, of course, since this is a typographic overprint one should be able to plate all 100 positions as slightly different. In his 1953 publication, Dr Seichter does not discuss Reprints but in his 1966 Sonderkatalog he lists "Neudrucke" sold by the "Sowjet-Agentur" and values them all at 40 DM each. He does not give any indication of how to tell Reprints apart from Originals and I don't think I have ever seen a Seichter "Neudruck" mark on the back of Odesa I stamps. John Bulat lists Reprints on more values than Dr Seichter (Bulat 1079 - 1095), giving them a uniform mint price of $25 each which is much higher than for most of the Originals. He heads the list, "Overprinted in different variety of black ink" but does not say what the difference is. Before his death, Dr Ron Zelonka helpfully expertised for me two copies of 20 kopeck perforated stamps with Odesa I overprints, identifying one as an Original (Bulat 1068, $75) and one as a Reprint (Bulat 1084 $25). See the illustrations above. It seems that the Reprint is characterised by ink infill between the double outlines giving an overall blacker appearance - something you might expect from a re-used typographic plate with a build up of old ink. However, this alone is not the whole story. Ther are heavily inked Originals which look similar. And some cliché positions seem to fill with ink more than others. What is distinctive on the Reprint is the overall uniform darker impression. What someone with a taste for research could do is this: assemble copies of a basic stamp for which there are no Reprints: for example, both Seichter and Bulat reckon that the very common 2 kopeck perforated is found only with Original overprints. 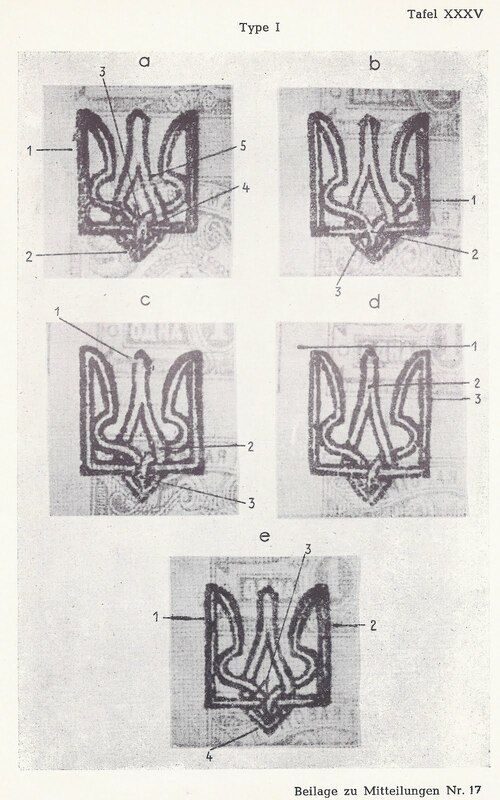 Then assemble stamps which only exist with Reprint overprints: for example, the 1 kopeck perforated. (This will not be easy!) Then try to work out the distinguishing features. In some cases, it will also turn out that the shades of basic stamp used for the overprint also differs between Originals and Reprints. This is the case for the 4 kopeck perforated. 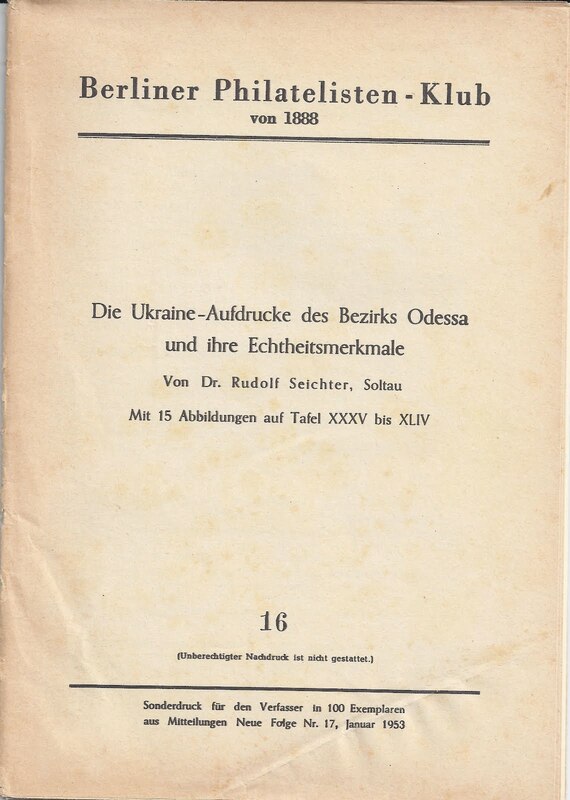 Postscript May 2012: A reader in the USA has kindly provided the illustration below showing Odesa I overprints which have been classified by Dr Seichter as Reprints (ND, Neudruck) - something I could not do. It can be seen that on all the stamps the overprints show what I called above an "overall darker impression". 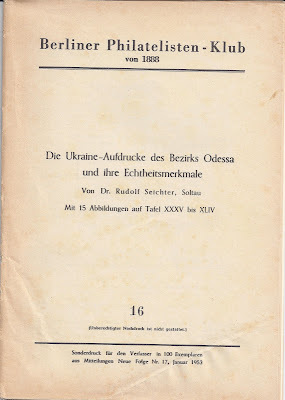 Thanks to this anonymous contribution, the reader is now in a much better position to set about classifying Odesa I overprints as Originals or Reprints according to the Bulat catalogue. It is just important to remember that in general Reprints are much scarcer and are unlikely to be found in small accumulations of Odesa I stamps.